A sick, twisted love triangle. Jordan Ferguson and Shawna Frye became good friends a few months backwhen Jordan made cheerleader and started hanging with a new group of friends. That's how the Timothy Lawrence incident happened. When Timothy suddenly dumps Shawna to start seeing Jordan, rumours start flying. Shawna gets her revenge, first by smearing her former friend's reputation. Then she steals back Timothy by tempting him with an offer he can't refuse. Jordan feels absolutely green with envy so much so that she considers doing everything in her power to get him back. Everything. Luckily, her old friend Kara Hendricks has been down that road too and knows Someone who just might be able to help Jordan as well. 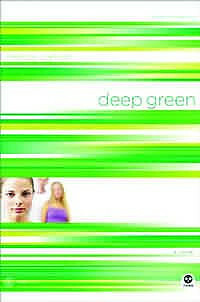 Deep Green by Melody Carlson was published by Navpress in February 2006 and is our 26164th best seller. The ISBN for Deep Green is 9781576835302. Out of all the books ive read this one helped me through tons of problems. I could really relate to the book and it really grabbed my attention. I loved it and I know many other people will! Got a question? No problem! Just click here to ask us about Deep Green.